It’s always such a treat going to the farmer’s market on Sunday mornings. Lots of fresh produce, the smell of frying Cumberland sausages for selling in soft white rolls, creamy butter, cheese and milk straight from the farm and little mountains of crusty bread, quiches, tarts and cakes. And also, invariably, you stumble upon some really interesting foods. Like purple cauliflower. Venison and wild garlic pate. Gyoza. Funny-shaped squashes and white aubergines. And tomatillos. Yes, someone here in the UK actually grows tomatillos! We’ve always wanted to try them but thought we’d have to cross the Atlantic for the opportunity. If you’ve never tried one, it’s a small green tomato that has a crisp, apple-like texture. Because we’ve enjoyed quite a bit of tex-mex cuisine this summer (when it’s 30 degrees in London, it just feels right), we thought we’d combine them with organic beef tomatoes to make a yummy salsa. 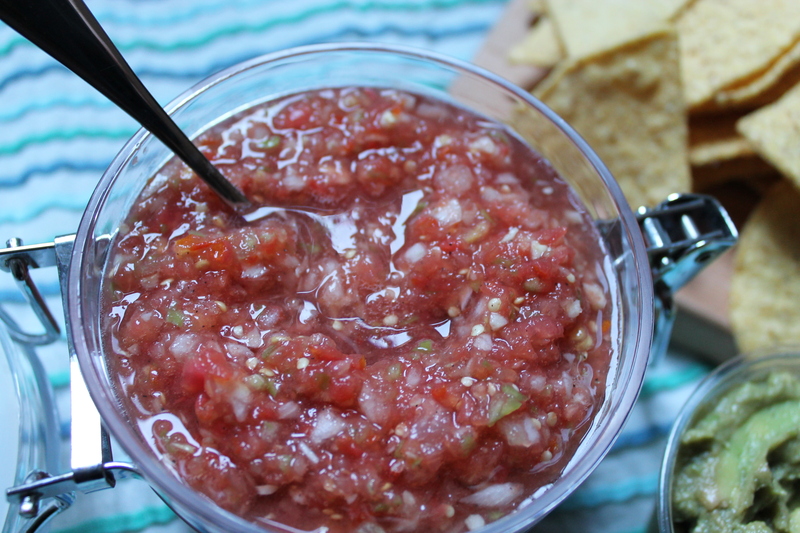 And it produced a really fresh, interesting salsa we love! 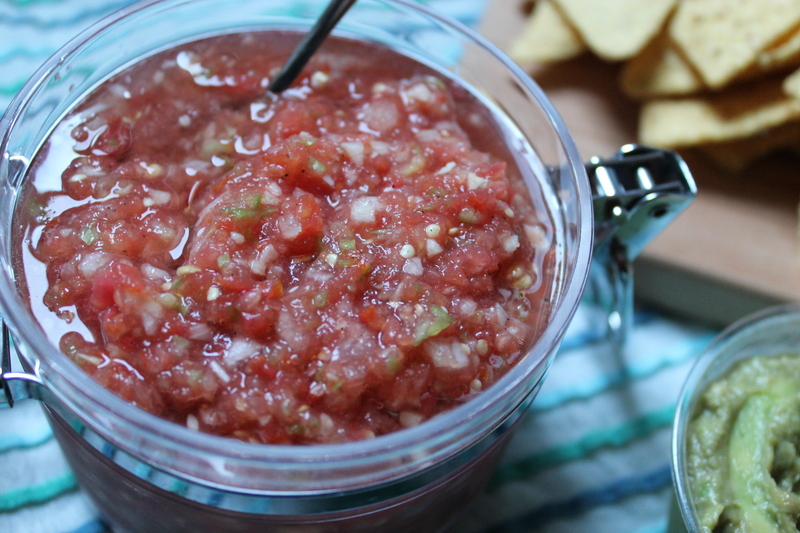 Place the tomato, tomatillo, garlic and onion in a food processor. Pulse until the dip is processed and comes together. Pour into a bowl and add the Tabasco, lemon juice, salt and pepper. 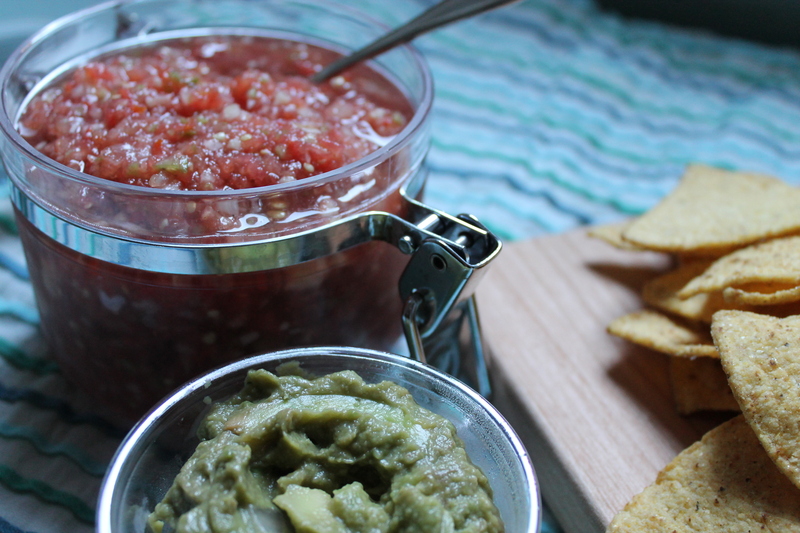 Enjoy with tortilla chips, in huevos rancheros, or whatever you want immediately or refrigerate for up to a week.